Chief Minister Chandrababu Naidu and Finance Minister Arun Jaitley agree that Andhra Pradesh has suffered financially since bifurcation in 2014. Yet, the Centre is unwilling to grant the state a Special Category Status tag. Here's why. Regional parties in Andhra Pradesh are trading charges with the Centre over granting special category status for the state. At the time of bifurcation in 2014, this was a promise made by the then government, headed by former prime minister Manmohan Singh. However, the BJP-led government has ruled this out now. Union Minister Arun Jaitley on Wednesday offered to provide the “monetary equivalent” but said the state could not be given “special status”. Telugu Desam Party (TDP) leader and Andhra Pradesh Chief Minister Chandrababu Naidu, addressing the press on Wednesday night, said the party would withdraw from the central government for not granting the special category status to Andhra Pradesh. Naidu reiterated that Andhra has suffered financially since bifurcation. Jaitley agrees with Naidu that Andhra, which was unwilling to bifurcate, has suffered in terms of resources since 2014. So why can’t the Centre grant Andhra special status? Under the 14th Finance Commission recommendations, the “special status” categorisation has been removed. It is now restricted only to the northeastern and three hilly states. The recommendations were accepted in 2015, a year after the Andhra was bifurcated. Also read: What do states with the Special Category Status receive? What has the Centre offered instead? The Centre has offered to provide “special assistance” to Andhra for five years. Equivalent to the Special Status Category, it has offered 90:10 funding for all centrally sponsored schemes — which adds up to about Rs 20,010 crore of central assistance. Further, while the state pegs Rs 16,000 crore as its revenue deficit, the Centre, which has already paid Rs 4,000 crore, says it will release pending amount of Rs 138 crore. The TDP also wants funds from local agencies like Hudco and Nabard, while the Centre has proposed funding in the form of loans from external agencies like the World Bank. For the Polavaram project, the state has said the Centre must bear the total expense, including the cost of land acquisition, relief and rehabilitation, amounting to Rs 33,000 crore. The Centre, which has paid Rs 5,000 crore, assured more funds at a later point. For the state capital of Amaravati, the state wants Rs 33,000 crore. 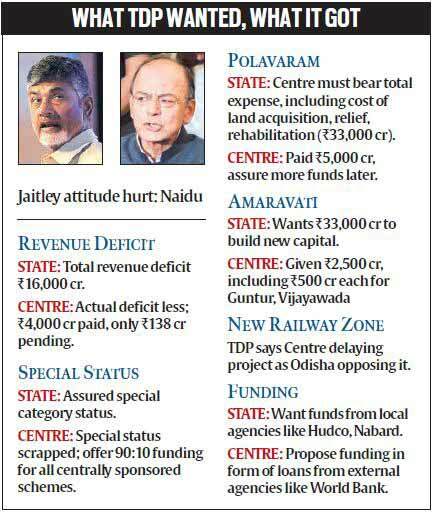 The Centre has already disbursed Rs 2,500 crore, including Rs 500 crore each of Guntur and Vijayawada.